Bowers itself houses 25 residents, including UChicago undergraduates, graduate students, married couples, and individuals unaffiliated with the University. Residents of the co-op live in private bedrooms and share the rest of the building as communal space. In addition, residents evenly distribute cooking and cleaning responsibilities among themselves. Rent in the House ranges from $360 to $580 per month. 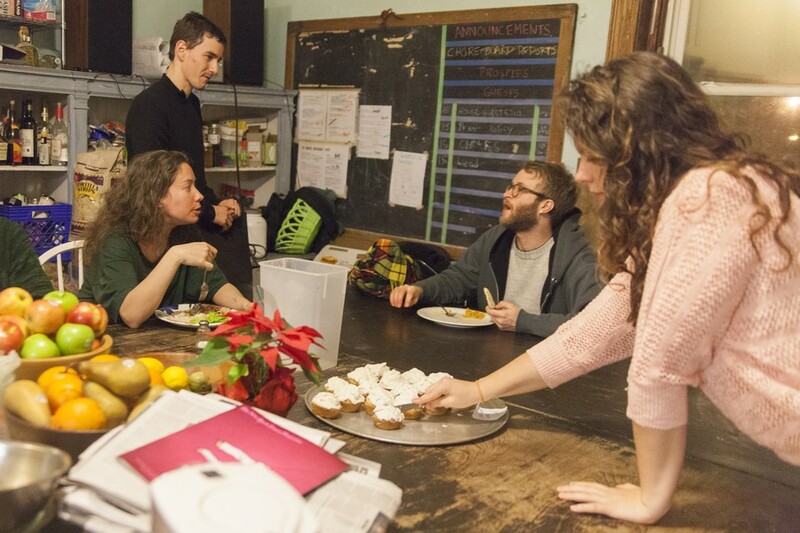 Every night, dinner for the entire co-op—vegetarian fare, but with the mandate that every meal contain protein—is prepared by one co-op resident in the communal kitchen. As there are 25 residents, each resident is obligated to cook once every 25 days. For other meals, residents have unlimited access to a wide variety of fresh food, which the co-op purchases in bulk. At present, each resident pays $190 a month for food. According to fifth-year Michael Eugenio, a co-op resident, the communal food system produces occasional hilarity when a member moves in or out of the co-op. “There will be times when someone moves out, and the supply of cereal goes up 50 percent. There will be pounds of dry cereal, just sitting there, for weeks. And I’ll think to myself: ‘Man, that’s how much cereal that guy ate!’” Eugenio said. In addition to cooking and buying into the communal food supply, each resident is expected to perform a few hours of chores per week, which are referred to as labor. Examples of labor include minor building maintenance, washing dishes, and buying food. Tasks are assigned on a schedule that rotates weekly. According to residents, including fourth-year Lilly Lerer, the co-op’s system of labor contributes toward building community. “Labor is the binding glue of our whole House. Nothing pulls us together other than the fact that we all want to live here and be members of a community. Living in the co-op is an emotional investment, and labor symbolizes that,” she said. According to Eugenio, the fact that nearly every co-op member is assigned labor also tends to produce amusing results. “We have a four-year-old girl in the building; she was assigned labor, too. She was supposed to clean the kitchen table, but she kind of stopped doing that after a while,” he said. Bowers residents believe strongly in democratic governance of House affairs: Labor is assigned and events are planned at house meetings, which take place every Sunday night and are mandatory for residents. “All House plans originate in House meetings, and most propositions are settled by majority vote. [The co-op] takes meetings very seriously; showing up to meetings and completing labor are necessary conditions for every resident seeking to have their lease renewed,” Eugenio said. According to Fedya Manin, a fifth-year graduate student, the functions of the co-op’s House meetings extend beyond the borders of Bowers House; in one meeting, Bowers nominated three representatives to a conference attended by all three Qumbya co-ops, which took place on February 9. “The attendees resolved to make getting a fourth house a priority. The major questions that remain on the table are where to put it and how to finance it. In terms of location, Woodlawn surfaced as a strong possibility,” Manin said. While plans to expand are tentative, residents agree that the institutions that characterize co-op life, including House meetings, assigned labor, and the diverse demography of the residents, have led to Bowers being a self-sustaining enterprise built on the concept of community. “I chose to move to the co-op because it offered the possibility of living with people who weren’t going through the exact same life stage as I was, as a college undergraduate. That spirit—a love of diversity, and of community—is common here, and I think it lends long-term stability to the House,” Lerer said. She also noted that there have been several cases of residents marrying after meeting in the co-op. Current resident Katie Mann, a sixth-year graduate student, met her significant other three years ago in the co-op. “We plan on getting married in the summer; in the future, we may move into a smaller co-op. People tend to associate co-ops with students; residents tend to be students, but I think that the coexistence of people in different life stages produces a rich experience that can’t be easily replicated,” she said.